Ecosystèmes Marins de l'Archipel des Comores is part of the Tentative list of Comoros in order to qualify for inclusion in the World Heritage List. I visited Moheli in August 2016, when stayed at Laka Lodge (http://www.lakalodge.com), the most interesting place to stay in Comoros. I spent my morning snorkeling in the Moheli Marine Park, part of the Ecosystèmes Marins de l'Archipel des Comores tentative World Heritage Site, some of the richest coral reefs in the Mozambique channel and where I saw green sea turtles, octopus, anemone fish and moray eel. I went on an afternoon hike with the Laka Lodge's manager to see Livingstone's fruit bats, which are endemic to Anjouan and Moheli and, with a nearly 5 ft wingspan, are one of the largest megabats. 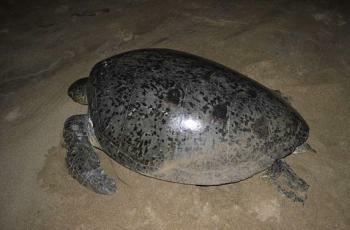 In the evening, I visited an isolated beach around an hour from Laka Lodge to observe newborn green sea turtles scamper to the coast and enormous adults lay eggs in the very soft sand.